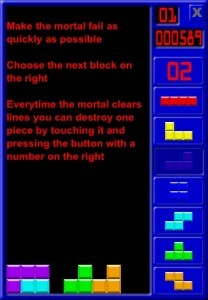 Here is a screenshot of an intriguing new tetris-variant in the app store, Master of Blocks, by Tuomas Pelkonen. I’ve had a chance to try it out, and you don’t get complete cart blanch to drop any old blocks willy-nilly, you basically have to pick from the blocks available, and once you’ve chosen one, you can’t pick that one again until all the others have been chosen. There is also a button to delete a single square that has already been placed. Probably the most interesting feature of this game is that it supports bluetooth multiplayer, so you can play a head-to-head mode where you choose the blocks for your opponent while they play Tetris, and then they choose the blocks for you. I was confused at first because I didn’t know it was going to switch, and we both had the same score. It might have been hard to balance, but I could have imagined you both getting points for different things while you play that mode, so you didn’t have to play two rounds to figure out who won. My wife and I actually played cooperatively for a while, which was more fun than it probably sounds like it would be. Again, because you can’t give them just whatever pieces you feel like, there is some strategy involved, and furthermore, using the delete-a-square button for good rather than evil was almost as satisfying. I imagine the game to have been inspired by the College Humor video The Tetris God (which if you haven’t seen it is well worth the watch), in which a merciless god controls the falling of Tetris blocks. There was a 4-story tall Tetris game set up at burning man back in 2008. I wish I’d been there to see it, and wonder where it ended up after the event. This screenshot someone took of a tiny tetris called Tetoris (via offworld) is pretty enough that if it were larger I would consider making it my desktop. The game itself reminds me a bit of the slow pace of Sequoia Touch, which has given me renewed pleasure in 2x mode on my iPad. It’s over a year old, but this Tetris bento box looks quite tasty.